How do you survive the ordeal of a performance? Overcoming stage fright, is that even possible? To manage rather than overcoming the fear of performing is a skill that can be learned as any other skill. You can not eliminate stage fright since it is an instinctive response to a stressful situation, but you can learn how to use it and to manage it to your advantage. Get control over your stage fright. The adrenaline build up you feel when getting nervous makes your heart beat faster and can make you feel out of control. But there are some positive effects as well: The rush of adrenaline makes your senses more alert. It helps your body to get ready and gives you extra energy. As a consequence your playing can become much more powerful, passionate and interesting if you learn how to control it. Instead of fighting this natural response, learn how your body reacts under stress and how to use it to make your performance even better! One of the most important things about overcoming stage fright is to start a long time in advance to prepare yourself, and to practice managing rather than overcoming stage fright. A book I really recommend to help you practice and prepare your music is The Musician's Way: A Guide to Practice, Performance, and Wellness (from Amazon) by Gerald Klickstein. 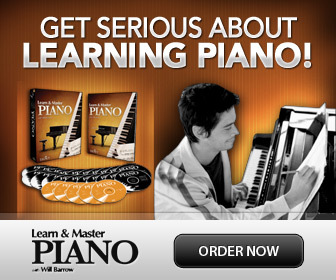 It is filled with great tips for musicians. Another important aspect is to make sure to select pieces that are at or below your current level. If the pieces are too hard you will naturally get nervous because there are too many possibilities for something to go wrong. When we get nervous our pulse goes faster. Ans as your pulse goes faster, your sense of speed changes. But knowing this, you could simply choose to play at a slightly slower tempo when performing under stress. Because of your faster heart beat - even though you might feel that you play slower- it will finally turn out to be the same tempo you played when you were relaxed! Overcoming stage fright entirely might not be possible to do. But instead of fighting it, learn how to manage it. The key is to practice this as anything else, way in advance. So, start already now preparing for your next performance! 1. Make sure your pieces are ready way in advance. At least a week (or a month on a higher level) . Actually, it is great if you can make yourself believe the date for the performance is a week earlier. This includes memorization. 3. Record yourself and/or video film yourself again and again until perfect. 4. 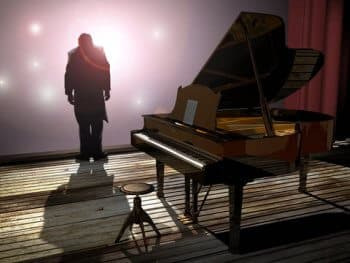 Visualize yourself successfully performing your pieces every night before you sleep. Try to play through each piece in your mind and make sure it “sounds” fantastic. 5. Slow motion practice. The day before the performance make sure to play through each of your pieces the very last time EXTREMELY slowly. Play through each piece slow motion, but with all details correctly, prior to that you should practice at performance speed- but the last time: super- slow. Then: Don't touch! 6. Take care of your body. Make sure to eat well (spaghetti is good!) and try to get a good nights’ sleep by getting to to bed early. Visualize how great it feels to perform before you snooze away… Or listen to a great relaxation or self hypnosis CD for overcoming stage fright. 7. DO NOT change anything! The same day as the performance: Practice all you want, but NOT your performance pieces! Just play them slowly and carefully on parts that are difficult- Slowly, maybe only once or twice. 8. Get oxygen. An hour or so before the performance: Take a brisk walk to get rid of some extra adrenaline, and get some oxygen. Do some stretching and bending- but don't overdo it. 9. Eat a banana. A half hour before the performance eat a couple of bananas!! Yes you heard right! Bananas are a natural beta blocker. 10. Take away self-focus by feeling generous. Right before you play, remind yourself you are giving the audience this gift of yours- your pieces. Take away the focus on you, and imagine you are presenting them with lovely gifts. Like drawings you made to your teacher when you were a child. Afterward- Give yourself a pat on the back for all the hard work, and take some time to think about what you could do even better for the next time! Remember that telling yourself not to have stage fright is not going to help. 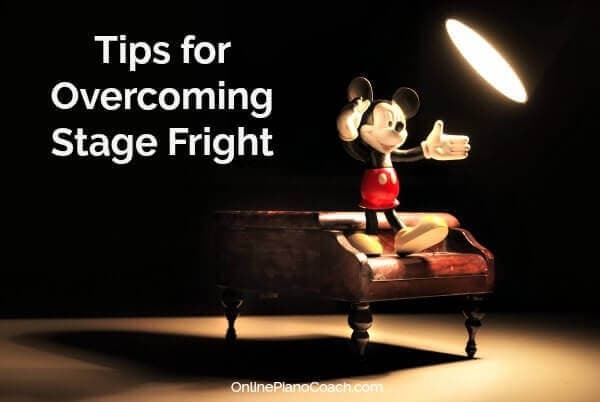 Overcoming stage fright means to learn how your body reacts under stress, as well as to plan and prepare a lot of time in advance and practice, practice. Who knows- maybe you will even realize that you finally enjoy the extra rush of adrenaline!